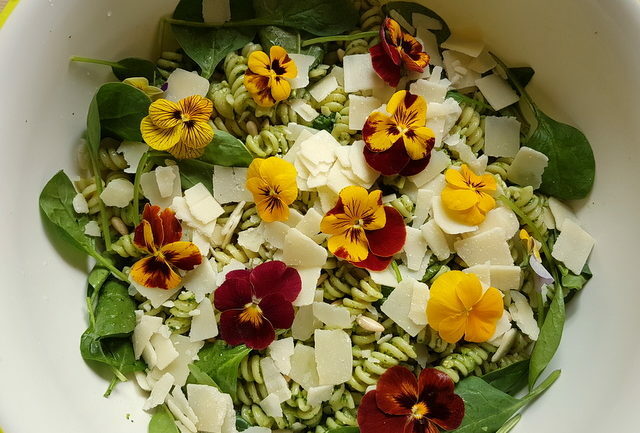 Green pasta salad with edible flowers! 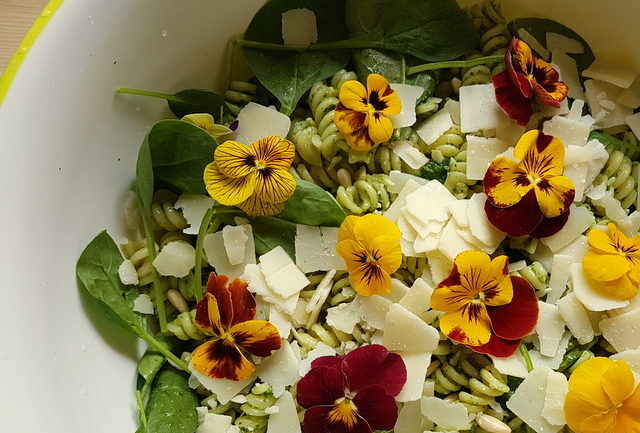 This green pasta salad is not only healthy, fresh and tasty, but the addition of edible flowers makes it very beautiful too! 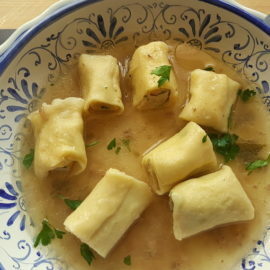 Pasta fredda in verde con fiori edibili. Italians call pasta salad either ‘insalata di pasta’ or ‘pasta fredda’, meaning cold pasta. There are, of course, hundreds of recipes for pasta salad here in Italy. Many of these are vegetarian and a lot have cheese in them. Some contain seafood, but few are made with meat. I guess this is because cold pasta is eaten mostly in spring and summer, when there is an abundance of fresh seasonal veggie ingredients. Plus, temperatures are higher, so lighter meals are more popular. The choice of ingredients for a pasta salad is pretty vast and for many people the combination used is often down to personal taste. 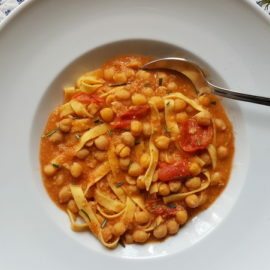 There are a few traditional recipes such as ‘crudaiola Barese’, a simple but delicious dish from Bari in Puglia. However, on the whole pasta salad is a contemporary way to prepare pasta. Hence the wide choice of modern recipes and the scarcity of traditional ones. This green pasta salad is, needless to say, made with mostly green ingredients. So, not a tomato in sight! 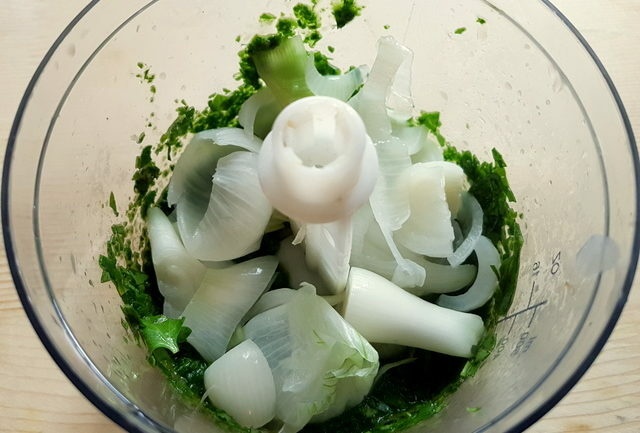 The basis of the sauce is a parsley, mint, baby spinach, pine nut and majoram pesto, to which blanched spring onions are added. I loved this idea. 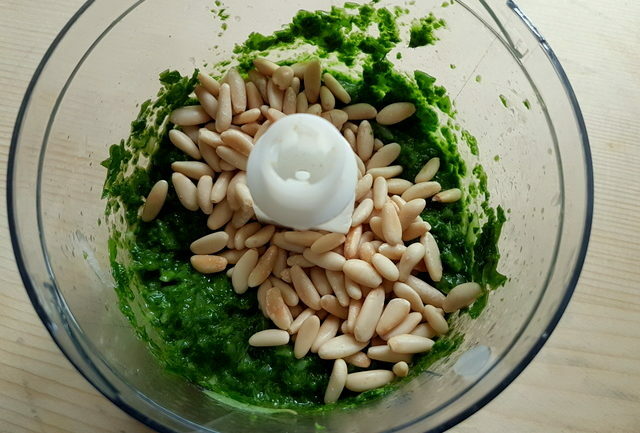 Pesto often contains raw garlic which gives it a very strong taste. Using blanched spring onions adds an oniony flavour that isn’t overpowering and much more subtle. 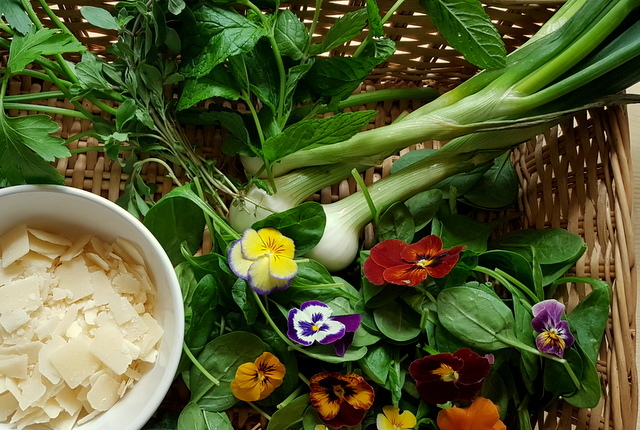 Rather than the grated cheese used with so many pasta recipes, this green pasta salad recipe calls for Parmesan flakes which are a favourite salad ingredient for me, as are the toasted pine nuts. However, for a vegan version just leave out the cheese flakes or us a vegan cheese. 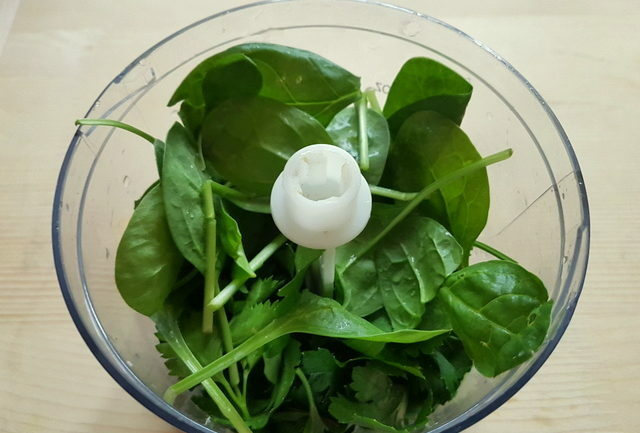 I added edible flowers to the bowl because they look so pretty and add a wow factor that’s bound to impress your guests, but of course you can make it without the flowers. Italians have an unspoken rule that pasta salad needs to be made with short pasta. I guess that makes sense because cold spaghetti just doesn’t cut it! You can use any short tube pasta such as penne or rigatoni but my favourite is fusilli. The fusilli I used actually comes from Pisa in Tuscany. 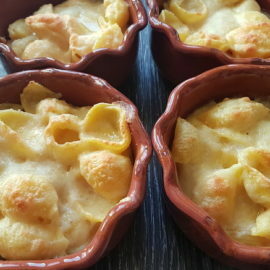 It was made by an artisan pasta maker called pastificio Martelli. This family-run company produces excellent handmade, bronze drawn pasta. 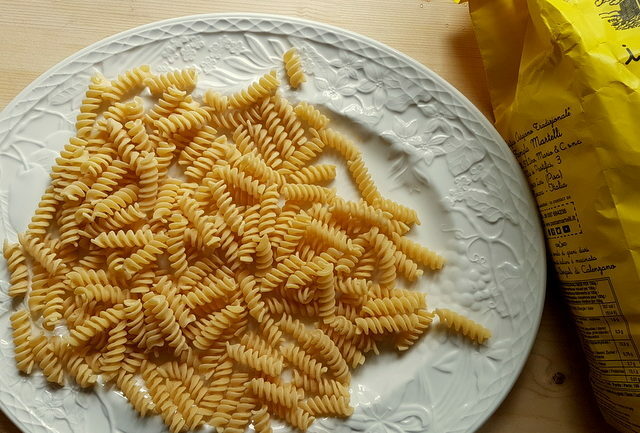 This fusilli di Pisa is smaller but more elongated and narrower than normal fusilli. Each piece of pasta has 7 spirals, like the Tower of Pisa. In fact, this pasta is said to have been inspired by the story of a pasta maker from Pisa in 1284, who created pasta in the image of the city’s famous landmark. 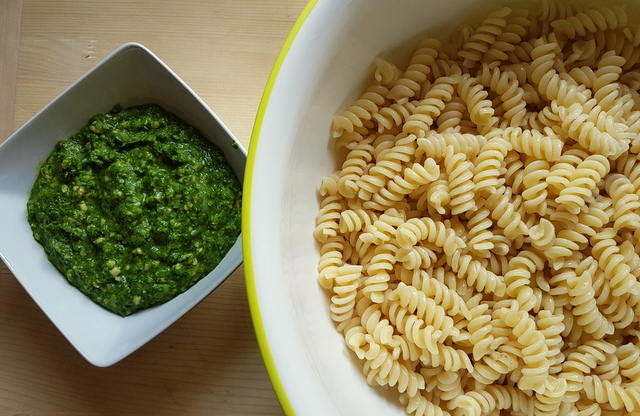 This fusilli worked so well with this recipe as the green sauce really got into the pasta spirals, making each mouthful super delicious! So, fusilli would definitely be my number one choice for this green pasta salad recipe. Tips for making a great pasta salad. To prevent your pasta from sticking together after cooking, it’s best to rinse the pasta with cold water after draining it and then put it into a bowl and add a little olive oil to it. Mix the oil and pasta so the pasta pieces are slightly coated in oil. The other ingredients should really be prepared beforehand so that you can add them to the pasta immediately. Italians prefer pasta salad to be tepid or at room temperature rather than out of the fridge. However, you can make it in advance. I made this green pasta salad a few hours before serving and kept it in the fridge covered in plastic wrap. However, if you do that. Take it out of the fridge 30 minutes before so that it can be served more or less at room temperature. Cold pasta is such a great versatile dish. You can eat it as a one course meal, offer it as side dish at a barbeque or take it on picnics. I made this salad for my birthday barbeque last Sunday. My family and guests loved it. I’m sure yours will too. Loving everything about this pasta. I agree, it’s the perfect side for any BBQ or celebration. I will definitely make it many times during the summer. Pesto and edible flowers. I love how colourful and fresh this salad is. And it’s versatility. I would love to try adding some edible flowers in my dishes. Such an inspiration. WIll start looking for edible flowers at the farmer’s market now! I agree with you, I love using the flaked parmesan cheese. It is so much more elegant and you seem to be able to taste it more. Ohhh I got some edible flowers at the farmer’s market today! I never thought of putting them in a pasta salad!! Beautiful! 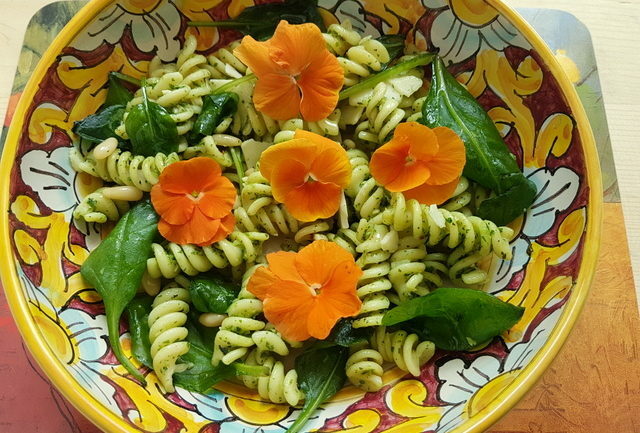 I love using edible flowers in salads – perfect summertime treat! I also love the look of edible flowers, but I don’t know where to get them! 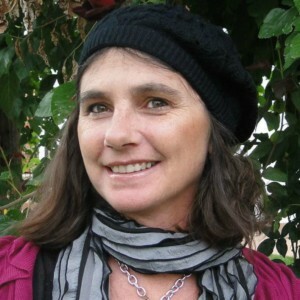 Do you grow them, or buy them somewhere? I love everything about this recipe, from its green sauce to the fact that you’ve got flowers in there. Don’t you just love summertime for its bounty? The pansies are so pretty! How fun! This looks great! I love the idea of edible flowers! Pretty and delicious! How fun! I love the idea of edible flowers! Pretty and delicious! Pesto is probably one of my favorite sauces for pasta, or really anything (I put it in Portobello Mushroom Caps, and then back them – delicious)! I have never used edible flowers in my cooking, but have been thinking of using them. i love that you are using them in a pasta dish though, I usually only see them in desserts.